There was a time when we had to literally spend hours to make a Lego building or a Lego car, but thanks to the MakerLegoBot, things have become easier now! Honestly, with this MakerLegoBot, you wont have to sit long to design your Lego structure. All you need to do is design a Lego model in MLCad and feed it to the robot. Well, the robot will print the model not on paper, but basically, it will build the whole Lego structure for you. Isn’t that one amazing robot? I have never seen a thing like this before, and actually, to be honest right now, I am wondering whether or not it is real and as efficient as it sounds. Before we start off with the functions, I must tell that the robot was designed by the team at Battle Bricks. The robot uses Mindstorms NXT computer. It actually uses three of those computers to control the printing press. Now, a feed mechanism is integrated on the side of the machine that has all the Lego bricks in it. This is from where the robot grabs the bricks and puts them into production. Whatever Lego design plan you feed to the robot, it will grab the bricks from here and create the design. Your Lego plans need to be fed to the robot through a USB. Once the plans are fed, you can see the robot get to work right away. The good part is the way it works and probably the reason why they call it ‘The Lego Printer’. Plans to create can be downloaded from the BattleBricks site in CAD format. 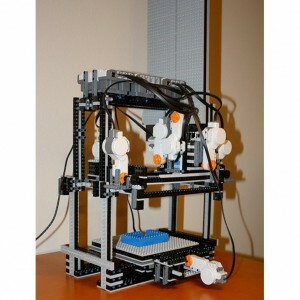 I personally love the idea of a Lego printer, and I guess it is one useful thing especially for Lego lovers. Although it might be quite expensive and energy consuming, I still feel every Lego lover should have it. You never know when you might get into a Lego war with your pals and this robot can help you out! Check out some more Lego stuff here: The Lego Calculator and The Lego Figures PC.